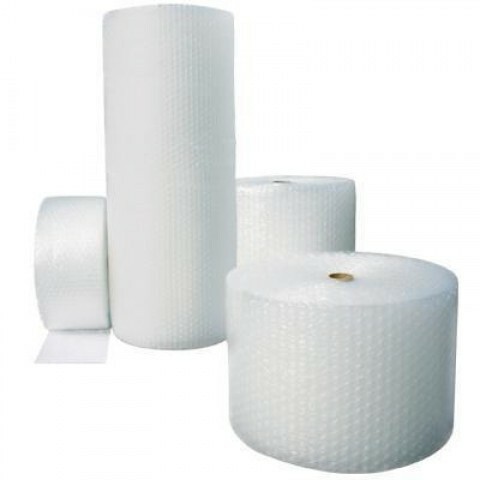 Buy Premium Quality Small & Large Bubble wrap rolls From £2.95 Only, Available in All Bubble Wrap Sizes (300mm/500mm/750mm/1000mm/1200mm/1500mm, 50m, 100m rolls) at Best Prices and Next Day Delivery By Wellpack. Bubble wrap is a pliable transparent plastic material used for packing fragile items. Regularly spaced, protruding air-filled hemispheres (bubbles) provide cushioning for fragile items. Bubble wrap, standard and with colored markings as electrostatic discharge materials, and in different bubble size The bubbles that provide the cushioning for fragile or sensitive objects are generally available in different sizes, depending on the size of the object being packed, as well as the level of cushioning protection that is needed. Multiple layers might be needed to provide shock and vibration isolation. A single layer might be used just as a surface protective layer. Bubble wrap is used to form some types of mailing envelopes. Bubble Wrap 50m x 100m x 300mm / 30cm) / 500mm / 50cm / 600mm / 60cm / 750mm / 75cm / 900mm / 90cm / 1000mm / 1m / 100cm / 1200mm / 120cm / 1.2m / 1500mm / 150cm / 1.5m x 50m x 100m Bubble Wrap Rolls.